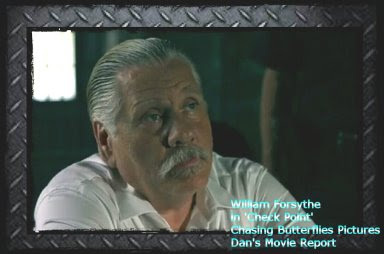 Greetings valued Dan's Movie Report readers. 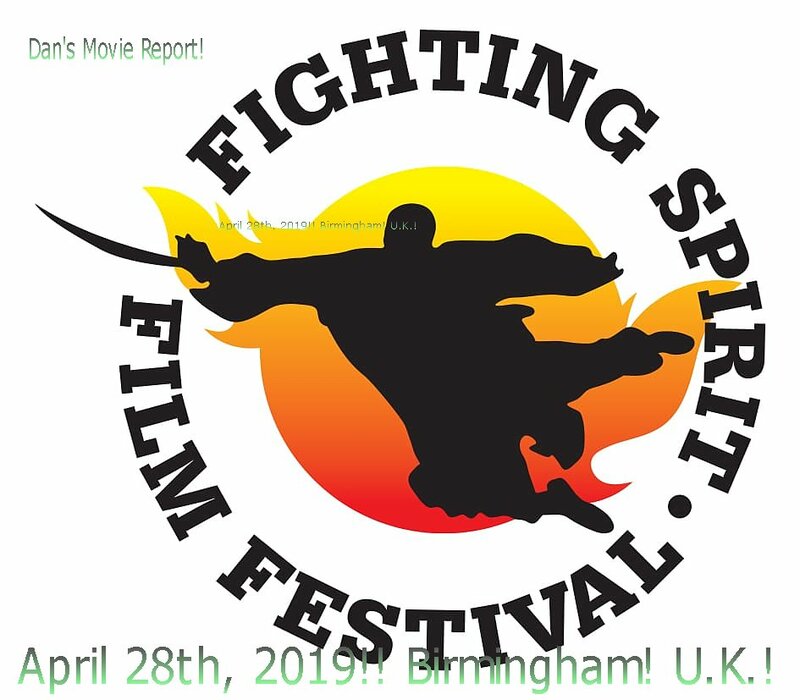 Today, Friday March 22nd is the day the tickets are available to the Fighting Spirit Film Screenings in Birmingham! Please act fast, the 100 seat theater is sure to be sold out quickly! Fighting Spirit Film Festival is the UK’s ONE and ONLY fighting film festival – it’s a celebration and screening of martial arts and action movies. 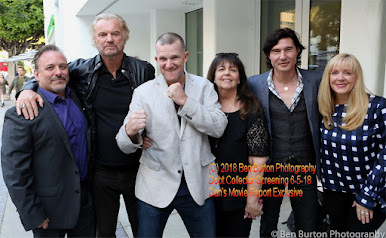 The festival is in its 4th year of bringing together the martial arts and action film fan and film making community – Fighting Spirit Festival continues to inspire others to participate in martial arts and/or make films with martial arts and action content. 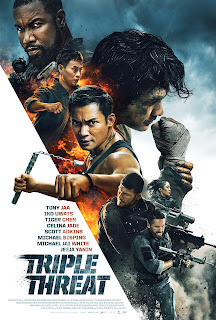 promises to be a flip-kicking event with the UK premiere of “Triple Threat” directed by Jesse V Johnson and starring Tony Jaa, Iko Uwais, Tiger Chen, Scott Adkins, Michael Jai White, Michael Bisping, Celina Jade, Ron Smoorenburg and Jeeja Yanin! 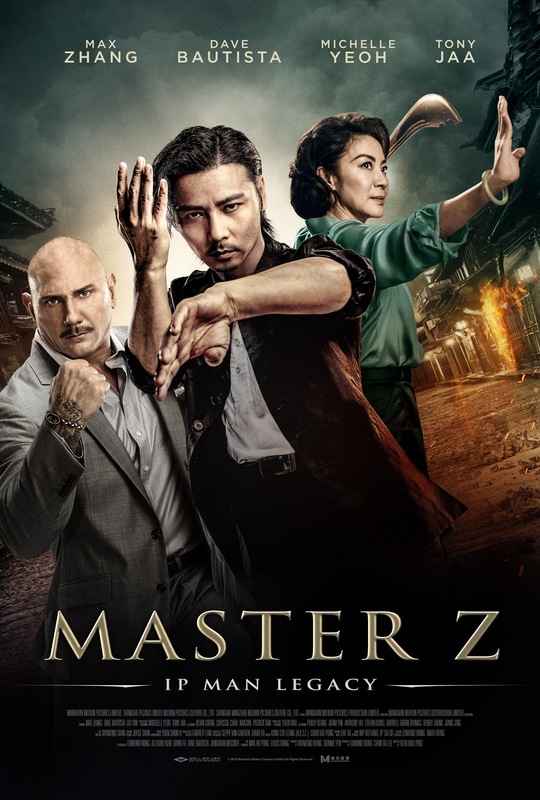 In addition the UK premiere of the eagerly awaited “Ip Man” spin off “Master Z” starring Max Zhang, Tony Jaa, Michelle Yeoh, David Bautista and produced by Donnie Yen! Throughout the event there will be screenings of short films: Chopsticks / Dead End / Tranh et Nowak and Shaolin Warrior Monk as well as martial arts demonstrations - British Wushu champions Samuel Mak and Steve Coleman, Wolverhampton based Kru Linford Melbourne (Muay Thai/Kickboxing) and Sifu Tony Clements (Southern Praying Mantis). Here is what people have said about the fest! DT: I know you have worked with Jesse on so many projects the past 15 yrs or so, Triple Threat was by far the biggest budget and most high powered cast, how did you approach your portion of the filming when you got the call to coordinate the fight sequences filmed in L.A.? L.L. : Production gave me 24 hours to put together finished pre vis of fight. I quickly got stunt fighters to be Tiger and Michael, got action cameraman ,choreographed fight, picked angles, shot it, and edited same night. DT: Your action style is a bit different from Tim Man's yest things merged in a seemliness manner, did you have to make any adjustments to the choreography prior to filming, if so what changed, also were there any adjustments on the fly? L.L. 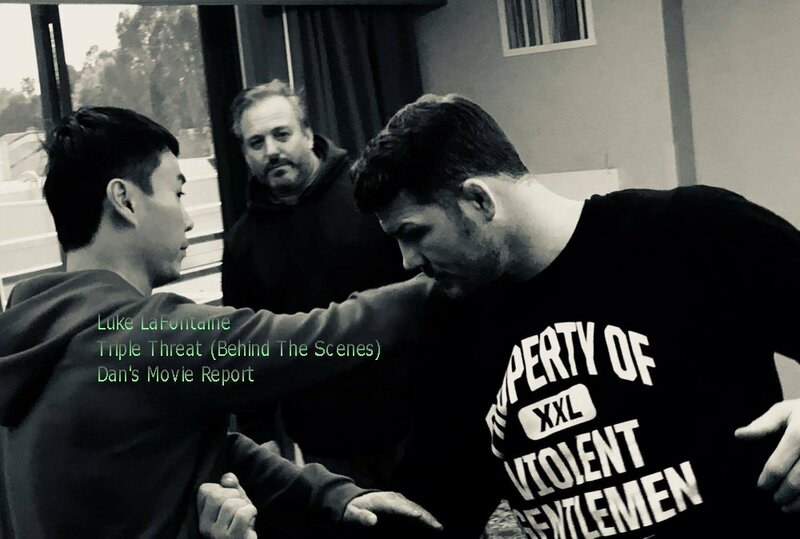 : I was able to look at some of the footage, saw direction Tim was going, was careful to keep Tigers and Michael's (Bisping) technique while adding and blending my choreo and shooting style. There were minor changes on set w Michael because hes a beast and keeping moving forward. I didn't want them battling right off the set. 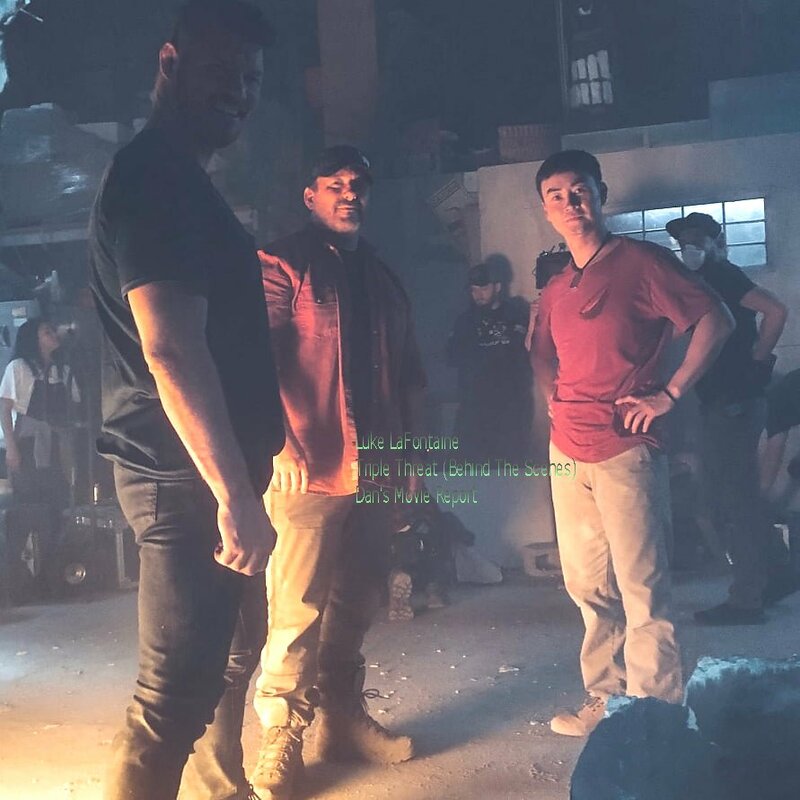 Above: Behind the scenes photo of Luke working with Tiger Chen and Michael Bisping in Triple Threat. 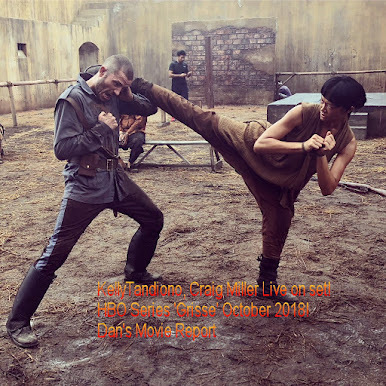 DT: Chat about working with the actors, how much time did you have to prep for the fight sequences? Curious also as to the input Jesse gave you with regards to the fights, was it where to end or was he kind of more hands off, letting you handle it? LL: I met w TIGER CHEN and MICHAEL BISPING in the morning, showed them the previs, Tiger and Michael had a few great ideas w incorporated in. I added some bigger moves for both of them. we rehearsed for about an hour, they picked fight up quick. Both consummate pros. It was like a Tornado versus an earthquake! 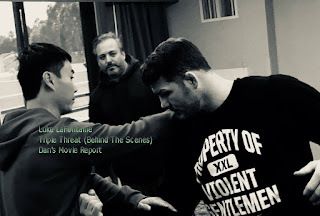 Above: Luke on a short contemplation of the next action sequence with Tiger Chen and Michael Bisping on Triple Threat. 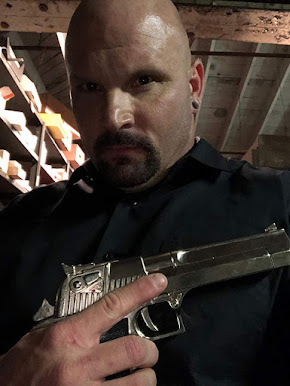 When you work out fights, in general do you do a slower run through off camera, then film slow on camera to get the spacing right, curious how you decide angles and moves, I realize it is Jesse's or director's job, but since you are choreographing the action, I figured you may have learned a few new tricks along the way. Also did you have an opportunity to interact with Tim Man during production of Triple Threat to compare notes? Yes, we always do walk thrus of the fight sections before shooting. Jesse and I have always worked well together. I make sure to listen to what he wants and he trusts me to make it all happen. I picked the angles based on how the fight traveled thru the set. Jesse got hero acting moments. Then we shot the fight and got extra specials for the end. 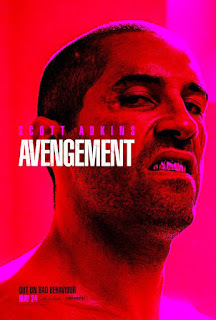 Shifting gears to an Avengement question, I know Avengement has completed principal photography and you cannot say much, I am curious if the action is more visceral, and in your face, like a Savage Dog, than Triple Threat, and perhaps some non plot spoiler things you can share about the production. Avengement is one of our most vicious most brutal set pieces of action. More realistic and shocking at times while still getting your blood pumping. Avengement is a game changer. New character for Scott , and I think his Best!!! Happy that Scott and Jesse asked me to come to London. great creative time. 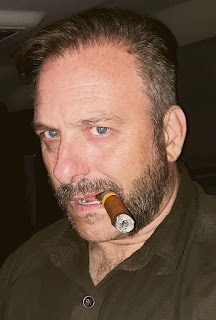 Final thoughts, I am curious on your thoughts on the state of action movies today, we have chatted about this, but I wanted to give you the opportunity to discuss perhaps some things that can be changed and some things that you enjoy about today's action films. LL: There have been real advancements made technically in action. 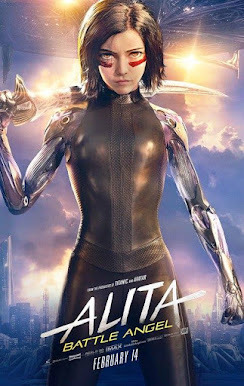 J.J Perry, Chad Stahaelski, David Leitch, Darren Prescott, Sam Hargrave, Garrett Warren and Clayton Barber along w others have been raising the bar for action films. Id really like to see more versatility and creativity to go in new directions w choreography. HK/Chinese cinema style was great and Marvel style action is really good,but its a new era and entirely new styles need to be born from creativity here in the us. DT: Thanks again Luke, for another enlightening interview! LL: Thanks Danny!! Always a pleasure. Abduction (2019) - Movie Trailer Unleashed!! 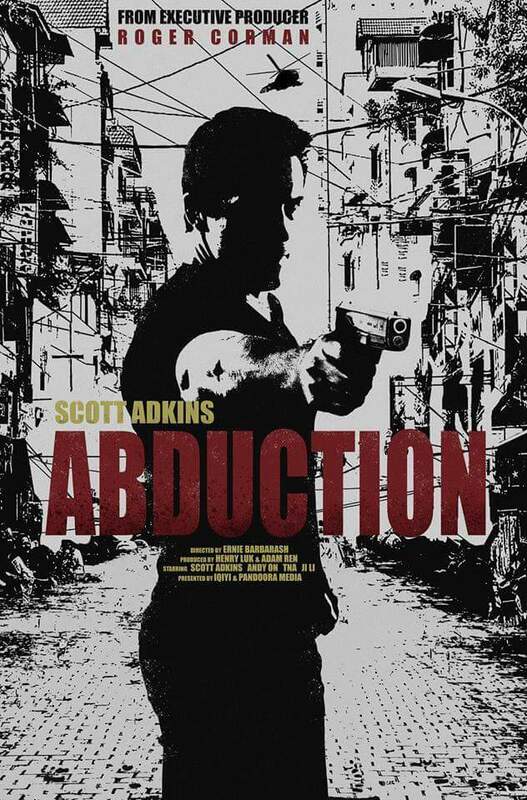 New Scott Adkins, Andy On, TNA movie!! Greetings valued Dan's Movie Report readers! Today Scott Adkins dropped a very cool new trailer of the film Abduction! The new film stars Scott Adkins, Andy On, and Truong Ngoc Anh. 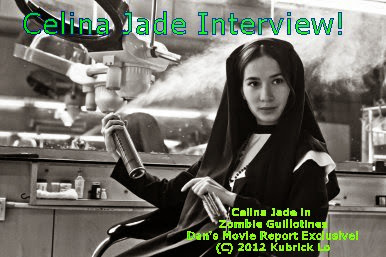 The Roger Corman produced film was also produced by Scott Adkins, and Truong Ngoc Anh's company TNA Entertainment. The full force action film set in the near future. 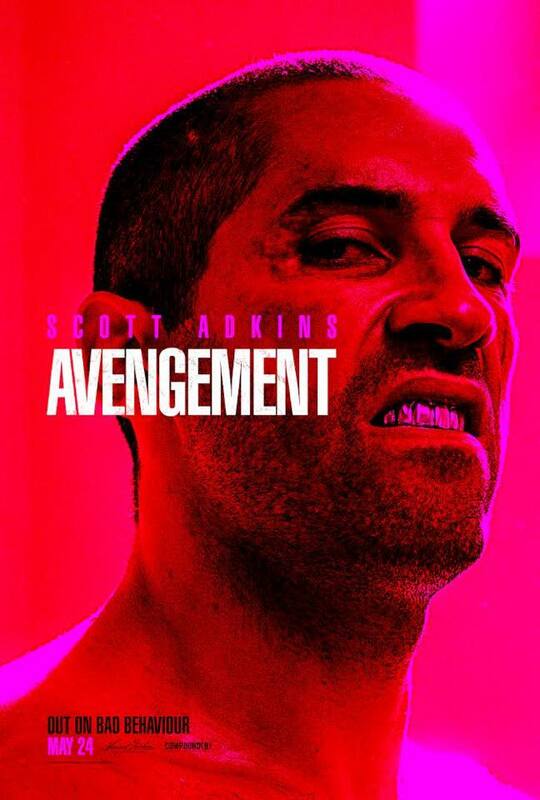 Although not much is known about the plot, someone abducted Quinn's (Scott Adkins) wife and he wakes up in the future, and he thinks it is still 1985. Expect copious action, loads of fist fights, and a very cool Truong Ngoc Anh. Expert action Maestro Tim Man, provides the choreography, and whoa, many bodies will hit the floor. Interestingly enough expert martial Artists Brahim and Myra Mala are also in the film, in case you have not heard of Myra, oh you will! 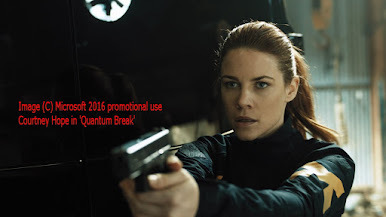 Above: Redcon-1 Poster from IMDB, used for promotional purposes only. Not monetized. Greetings valued Dan's Movie Report readers, thanks to my friend Tayah, who sent me a three DVDs or Redcon-1 I am finally going to review the film and do a contest to give away a DVD. details next week! 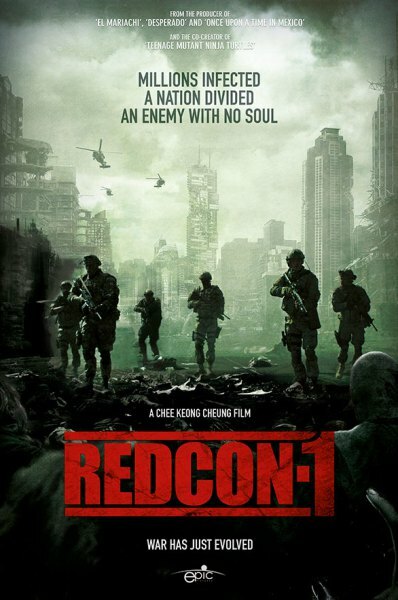 Redcon1 is a zombie film, I found it decent. 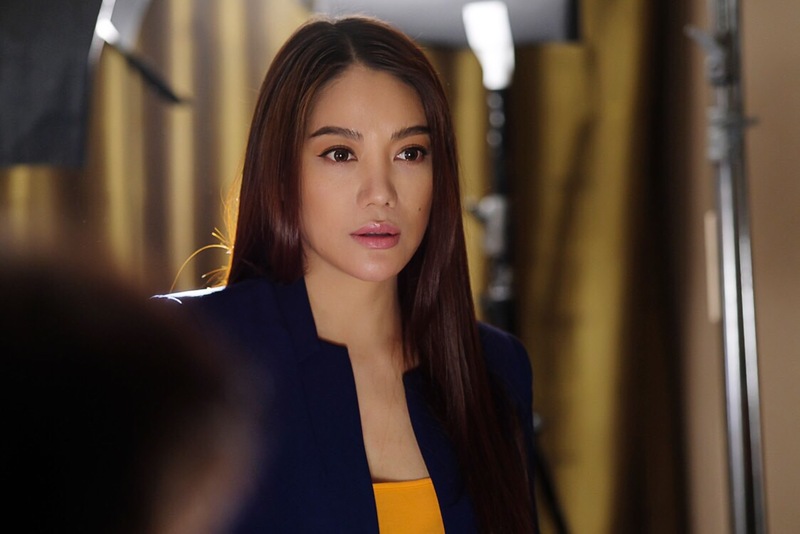 While the action is good, and a lot of things are thrown in, there is just no filter nor focus for the production. 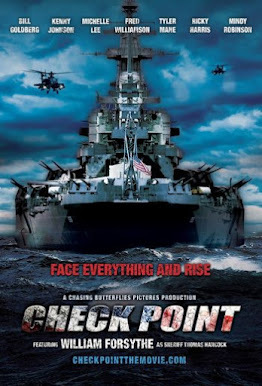 A series of events unfold leading to an apocalyptic outcome, yet there is not enough of a human element and the fact it is almost two hours in length, makes for a difficult watch at times. The negatives aside, Redcon-1 has a lot of cool elements, the movie feels big, many extras wide scope lots of props, Redcon-1 not only was full of action, it brought the audience into it. Right from the opening scene in an ambulance where the patient was about to die and then the ambulance doors swung open to reveal the same patient and the two paramedics as zombies, is the audience thrown into the fray. I think this is the right way to do zombie films, not from an observer on a monitor, but from inside the action. Things do get more interesting when the military is brought in to “control” the situation, of course this leads to more mayhem and killings and attacks. 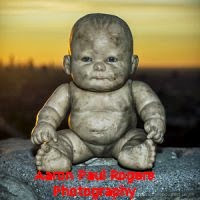 These are not your parents' zombies they move with a ferocity and quickness, which actually adds to the fear. Sorry to say , 2019, zombies I can walk calmly away from are just not as entertaining nor frightening that the ones who come after me aggressively. Not to much else to say, it is a big cast of character in Redcon-1, no one steals the show. There is talk near the middle of the film finding a cure, but things of course do not go as planned. While the plot is mostly predictable, enough twists and turns exist to make Redcon-1 interesting. Overall this is a decent film as stated before, not great, not terrible, Redcon-1 rates a 6 out of 10. 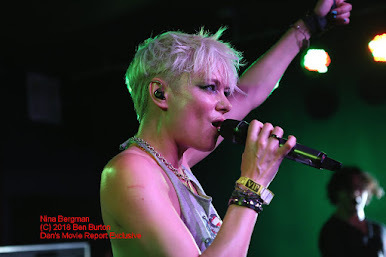 Special thanks to Mark Strange and Tayah Kansik for the help in locating this film for review.